On the back of a bilateral free trade agreement that entered into force in 2004, Chile and South Korea are enhancing two-way trade and investment in comprehensive areas and diversifying their export products, Chile’s top envoy to Korea said during a National Day reception on Sept. 18. 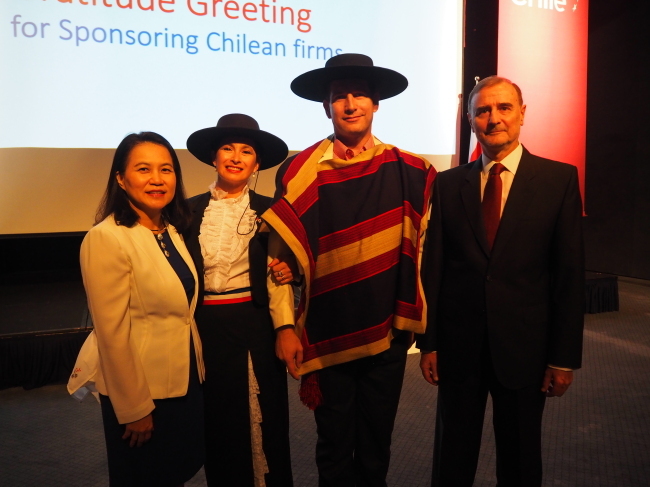 The free trade accord -- the first signed by Chile with an Asian country -- has increased bilateral trade at an average of 10 percent a year over the last 15 years, said Chilean Ambassador to Korea Fernando Danus during the event to mark the 208th anniversary of Chile’s independence from colonial Spain. Korean exports to Chile have grown steadily, from $569 million in 2003 to almost $2 billion last year, he added. He also said the two governments will start negotiations to upgrade the 15-year-old agreement in November. Chile welcomes Korea as an associate state of the Pacific Alliance, he noted. The institution comprises Mexico, Peru, Chile and Colombia, and allows tariff-free access across its member states, with a commitment to bolstering trade and investment links with Asia-Pacific economies. Seoul will soon kick off negotiations with the alliance member states for associate membership. Santiago and Seoul established diplomatic relations in 1962. Chile was the first South American country to recognize the South Korean government in 1949, and since then both countries have actively supported each other at the United Nations and other international settings, Yoo highlighted.